The grand essentials of happiness are: something to do, something to love, and something to hope for. This blog with lots of photos is intended for all my friends, family, and relatives. This post is pending for a long time. 13th October 2016 was our 11th marriage anniversary, which fell on a weekday. Although hubby and I are not into celebrating anniversaries in a grand way, we usually have some simple funny celebrations to create happy memories for us. So in the evening of 13th October, while returning home from his office, hubby bought various kinds of pastries and sweets like custard pudding, chocolate eclairs, several slices of chocolate cake and cheese cake from a convenience store located near our home. We had the pastries and sweets after dinner, and had a quiet anniversary night. On 9th and 10th October 2016, the weekend before our marriage anniversary, we went to Sendai City to have dinner at an Indian restaurant named Namaskar to celebrate our anniversary. It was also because I had been craving for an Indian dish named Masala Dosa for almost a year, and hubby did some internet search and found out that the restaurant serves Masala Dosa. 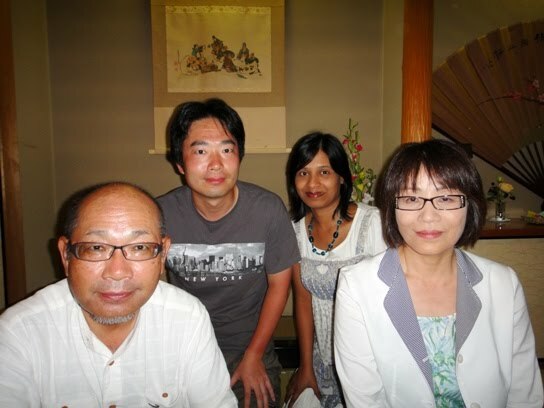 Namaskar restaurant is located in Minami-machi dori area in the heart of Sendai City. The restaurant serves authentic Indian food cooked by an Indian chef and his assistants. The restaurant has bilingual staff and serves north as well as south Indian delicacies for lunch and dinner, with the lunch on Saturdays being buffet style. The restaurant has a seating capacity for 80 people, and is ideal for parties, seminars or even wedding receptions. On 9th October, we left our home in Yurihonjo City at about 1.30 pm. Namaskar restaurant is located about 245 kilometers southeast of our home, and it took us about 3.5 hours of car ride to reach near the restaurant in Minami-machi dori area in Sendai City. After parking our car at a nearby car parking lot, we realized that it was just 5 pm and there was still about 30 minutes left for the restaurant to open for dinner. So we took a stroll in Ichibancho shopping arcade located in the downtown area. It is actually a covered mall that connects several streets together in the downtown area to create the largest arcade in the Tohoku region. The shopping area includes several different arcade malls and covers a T-shaped area along Ichibancho and Chuo dori. The arcade has various kinds of shops including budget 100 yen shops, an Apple store, clothing and souvenir stores, as well as many restaurants. While strolling along the shopping arcade, we saw a LINE store sporting a massive teddy bear at the front entrance beckoning people to enter the shop. While walking we also saw an artistic manhole cover with the motif of Tanabata star festival decoration. Sendai Tanabata festival is the most popular amongst all the star festivals of Japan. After about 30 minutes of enjoying the views along the shopping arcade, we left the area and went to Namaskar restaurant. We reached in front of Namaskar restaurant at about 5.45 pm. We clicked a few photos of us at the entrance area of the restaurant and then entered inside. We liked the ambience and the nice little Indian atmosphere inside. A restaurant staff showed us to our table and gave us the menu cards. To his dismay, hubby noted that there was no mention of Masala Dosa in the menu card. He was so shocked that I thought he would burst out crying as we had traveled about 245 kilometers to have Masala Dosa. Later I came to know that the restaurant stopped serving Masala Dosa a long time ago but they never updated their webpage or even the front of their restaurant where they proudly show an advertisement about Masala Dosa. I guess, it is our typical Indian way of doing things. Anyway since we were there we decided that we might as well have some other Indian foods that were advertised. We noted that the menu was vast. There were so many choices for dinner and it was challenging for us to decide what to order off the menu as everything sounded good. So we ordered several dishes and shared the food so that we could taste various kinds of dishes. We ordered a plate of Tandoori chicken and fish Tikka for starters which tasted delicious. We also ordered mango juice and an orange juice which arrived in cute Mughal style metal tumblers. I ordered a Thali set menu consisting of three kinds of curries, saffron rice, and Naan. Several kinds of choices were available on the types of curry and Naan. I chose two non-vegetarian curries, one vegetarian potato curry, and plane Naan for the set menu. The curries were served in small steel bowls that were placed on a round steel main tray along with saffron rice and a tiny Samosa. Naan was served in a small bamboo basket. Salad of shredded cabbage and soup were also included in this set menu. The taste of the curries was balanced with the right consistency and went fairly well with both rice and Naan. Naan was soft, chewy, and flavorful. Hubby ordered a bowl of eastern Indian style fish curry and saffron rice. The combination of saffron rice and the mild fish curry was perfect. He relished eating the food very much, and it reminded him of the fish curry he had at my parents’ home in India. Furthermore, he enjoyed having the potato curry from my set menu, which he felt was also cooked almost the same way as my mother’s food. The spicy and flavorful curries slowly made hubby forget about the Masala Dosa and we enjoyed the delicious food in the nice ambience of the restaurant. After having various dishes, we had dessert of some kind of Indian mousse. Finally, we wrapped our dinner with sweet Chai. We were very satisfied with the dinner and were so full that we could not move at all. Anyway, afterwards we went for a long walk in Sendai City and appreciated the surroundings and the moon above. That night we stayed at a hotel in Sendai City. The next morning, on 10th October, we checked out of the hotel at about 10 am and started back on our way home. We enjoyed the outside views during the car ride. We had lunch at a restaurant named Hiraizumi Resthouse Maesawa Restaurant located at Maesawa service area along the expressway in Oshu town of Iwate prefecture. The restaurant is famous for a variety of menus consisting of Maesawa beef, which is one of the best beef brands in Japan. Hubby had roast beef-don (roast beef rice bowl) set and I had Kalbi-don (Kalbi rice bowl) set. We shared our food and the dishes of both the sets were really delicious. After lunch, hubby had coffee from a vending machine at the service area. 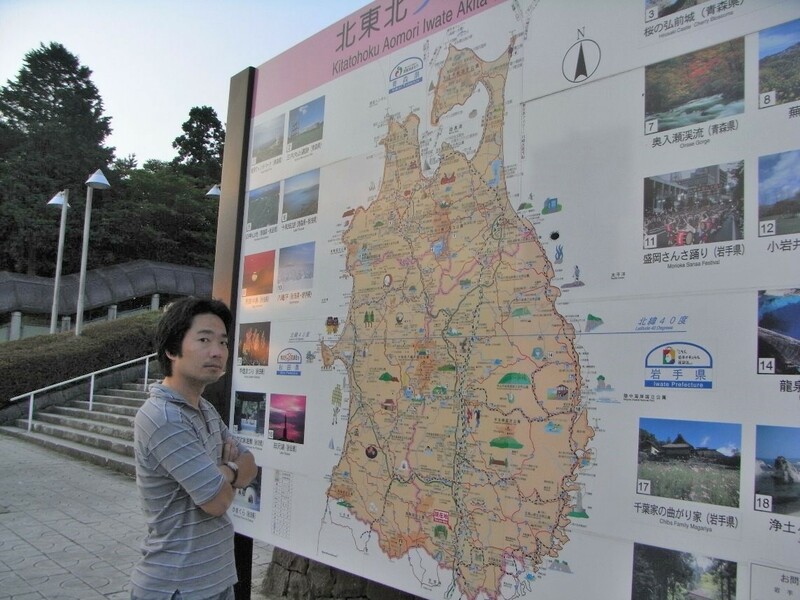 While having coffee, he started looking at an information board with a map and signs to various landmark sightseeing locations in northern Japan. All of a sudden he had that strange deja vu feeling that he had been there before, standing in the same pose. We have done a lot of sightseeing, so I could not recall the service area. After returning home, I looked up some old photos, and realized that we indeed have a photo of hubby standing in a similar pose at the same position way back in July 2008 when we had visited Genbikei Gorge in Ichinoseki City of Iwate prefecture. Here is a link to the post about Genbikei Gorge. I should mention here that our marriage anniversary on 13th October is the Japanese one. 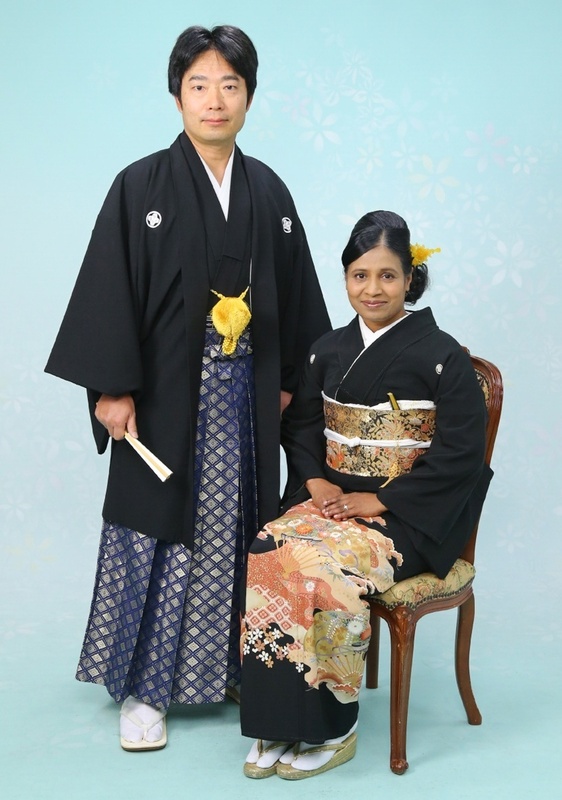 The marriage procedures of Japan are not yet recognized by the Indian government, so we had to register our marriage at the Indian Embassy in Tokyo on 26th December 2005, which we call as our Indian marriage anniversary. I love the fact that we get to celebrate our marriage anniversary twice in a year. So in the evening of 26th December, while returning home from his office, hubby again bought various kinds of pastries and sweets from a convenience store located near our home. He nicely arranged the pastries and sweets on a plate and even lit candles. We had the pastries and sweets after dinner. We made nice memories for a lifetime. I am thankful that God put the most wonderful husband in the world in my path. I am very happy and thankful for all the joy of having a loving and understanding hubby. Thank you very much for your nice comment Kokila Gupta. Thanks for the wishes Kalpanaa M. And thanks for appreciating the photos. 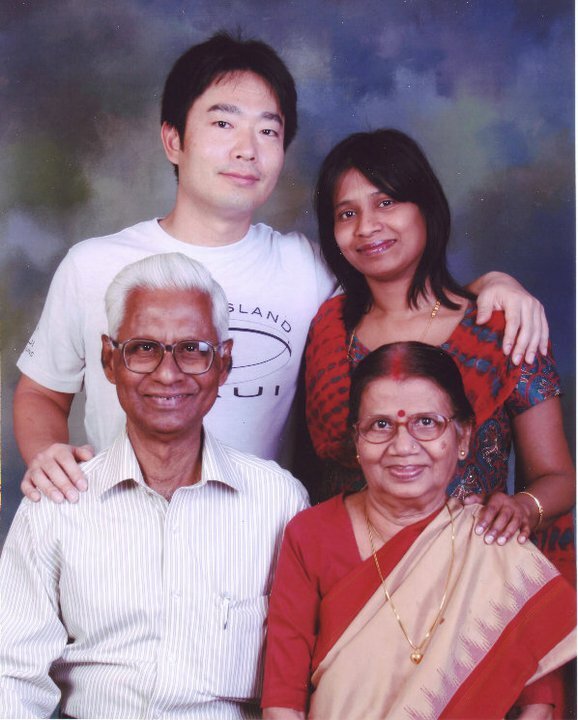 I am an Indian living in Japan for the past 21 years. I am a scientist researcher of Physics by profession. I have lived in Chofu, Tsukuba, and Yurihonjo cities and enjoyed living and working there. Presently I am a homemaker and enjoying a slow life in Ichinomiya city of Aichi prefecture with my Japanese hubby. In this blog I write about my life with hubby, everyday life experiences, and our sightseeing trips. We both love visiting news places a lot!